Have you ever wished that your piano sounded like Alicia Keys? Well now it can! 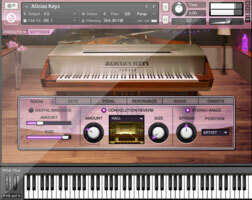 This programme created with Alicia Keys, along with specialists in the industry, captures the soulful piano sound that has become Alicia’s trademark sound. With Alicia working alongside the creators, she was able develop it to meet her recording needs. This means that when using it to record, you will be experiencing the sound and quality of a professional. The sound was sampled from Alicia’s own playing and recorded in her own studio, with her own Yamaha C3 Neo piano. Other features of the product include an optional feature that samples fingers hitting the keys, sustain and release features to get the authentic quality of pedalled piano and natural mechanical release noises for each of the 88 keys and pedal noises.